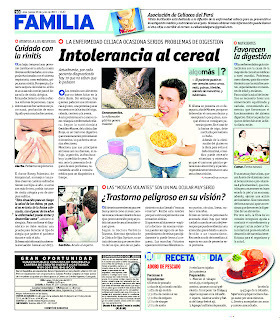 Interesante articulo del Dr. Osborne de la pagina web Gluten Free society, muestra como la deficiencia de un nutriente puede geneara una cascada de transtornos en el organismo. Gluten Sensitivity and Magnesium DeficiencyMost people are aware that gluten can induce malabsorption of nutrients. Gluten can cause damage to intestinal cells can reduce the production of digestive enzymes that help break down foods and aid in nutrient absorption. Additionally, it can contribute to villous atrophy, leaky gut syndrome, and diarrhea. All of these issues are associated with poor nutritional absorption. The following video discusses the causes and consequences of magnesium deficiency. Lack of this mineral is extremely common in those with food intolerance issues, and often times the symptoms mimic other diseases. 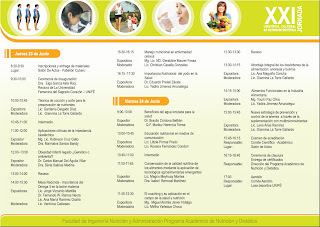 El Dia de mañana Sábado la Asociación participará en el II Congreso Internacional de Consultoría Nutricional organizado por NUTRAVIDA, brindando la conferencia Celiaquia y Manejo Nutricional, en el auditorio del Colegio Médico (Av. 28 de Julio cdra. 7 cruce con Grimaldo del Solar Miraflores) a las 5:00pm.